The following is a review for the online backup firm, Carbonite. The company was started in 2005 by David Friend, who got his inspiration to form the firm, after his daughter lost a term paper that she had saved on her hard-drive when it crashed. During the time that they have been in business, they have won many awards, and a few of them are the following; 2010 Privately-Held Company of the Year by the Mass Technology Leadership Council, Ranked #9 on the 2010 Inc 500 list (#1 in IT services and #1 in New England), and 2010 Tech Circle Gold award, SOHO. 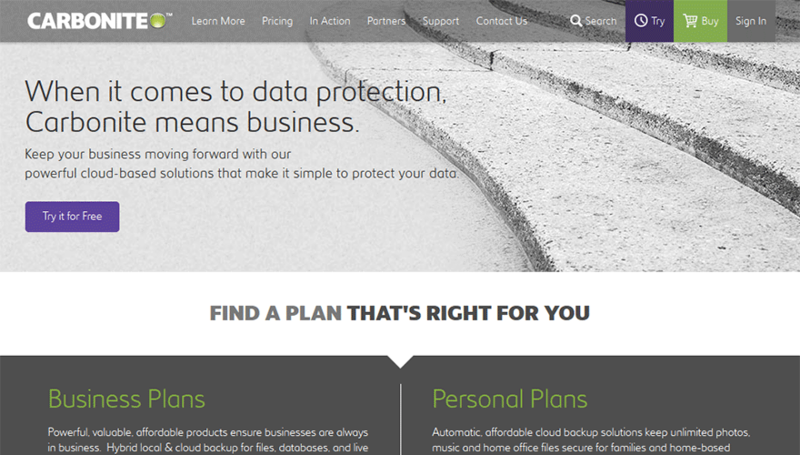 The online backup company Carbonite presently has 10,000’s of customers, from over 100 countries. They backup over 100 billion files, and add to that collection approximately 200 million each day. The company has been featured in many articles in different publications, including the New York Times, PC World, and the Wall Street Journal. It is very easy to determine, that the online backup firm Carbonite, is a serious player in this industry, which has a very bright future. If you are in the process of attempting to find an online solution for this complex problem, there is no doubt that this firm should be somewhere on your final list of companies to be considered. One of the aspects that most people and businesses fail to consider when making their online backup decision, is rather the company will still be in business 5 years after you start using them to store your most sensitive data. After all, you really do not want to wake up one day and discover that you will no longer have access to the files that you saved, because the firm went belly-up. We think that it is pretty safe to say, that Carbonite will be in business for just as long as you need them to backup your files and other critical data. Carbonite has a great feature set that most people need for online backup. Requires payment for a full year. No monthly payment plan available. Hasn’t offered a plan for Linux users and could use more mobile support such as Blackberry or Windows Phone. The online backup company Carbonite’s pricing structure is very straightforward and easy to understand, it cost $59 a year for an individual to have unlimited backup space. Business pricing starts at $229 a year, to use up to 250GB of backup space. If you require additional storage capacity, their business premier service runs $599 per year, and with it you get 500GB of backup space. They also offer a FREE trial period, which allows you to test them out and determine if the service that they provide is what you have been looking for. Most people that tryout the free service eventually become a regular paying member, since right at 70% of the people do eventually signup with Carbonite. We consider the customer service part of our reviews very important, and we were not about to let down our guard down with the online backup firm Carbonite. We always try to call their employees, and ask them a few difficult questions, to see if they can answer them, and explain their answers in such a way that most people with very little computer knowledge could understand what they are saying, and then implement their suggestions. You would expect a firm like Carbonite, who has such a lofty status to perform very well in this area, and we are happy to report that they did. The personnel that work in this department are exceptionally well trained, and really understand the service that the company provides. Carbonite customer service department supplies telephone and chat support 9AM to 5PM Monday thru Friday, Eastern Time. On the weekends, excluding holidays, you can also use these services 12 Noon to 4PM. They also have email support, and you can expect to receive your response the next business day. Note: The online backup company Carbonite also provides a start up guide that includes video tutorials, how to guides, and troubleshooting information, that is right up there with the best we have reviewed in this industry. To use the online backup firm Carbonate’s software is a fairly easy process. All you do is simply download it, install it by clicking a few buttons, and then you will be pretty much finished with the operation, if you can believe it or not. After that, each and every time you either modify a file, or create a new one, it will automatically be backed-up on Carbonite servers based on the schedule that you selected during the instillation process. If that is not simple enough for you, we really do not know what could be. If you are backing up your most important data on another company’s server, you really want to make sure that it is as secure as possible. The online backup company Carbonite uses a type of protection that is considered “Military Grade”, which simply means, that it is the very best technology that is available today. Because Carbonate’s software is so unsophisticated, yet so secure and simple to use, you can utilize their services regardless of what type of Windows based operating system your computer has. This is very important for you to read and understand fully. Carbonate does not backup and store files that are NOT presently on your computer. If you delete a file from your computer, it will only stay on Carbonate’s servers for 30 days, after that it will automatically be removed from their servers. Here is comes, our final rating in this review for the online backup company, Carbonate. Well, they are an industry icon with an exceptional reputation, and a very large customer base. They did not grow so rapidly because they fail to deliver on their promises, in fact the complete opposite is true, they are a company that can be trusted. If your principle reason for looking for an online backup company is to safeguard your most precious data, you certainly should strongly consider Carbonate. After all, they would not have over 10,000 clients now, if they had ever let a single one of them down in their time of need.